Attenuation refers to any decrease in the propagated signal power that does not affect its waveform. The attenuation increases exponentially with the increase in waveguide length, thus limiting the maximum transmission distance. An increase in attenuation by 3 dB corresponds to the propagated signal loss by 50%. 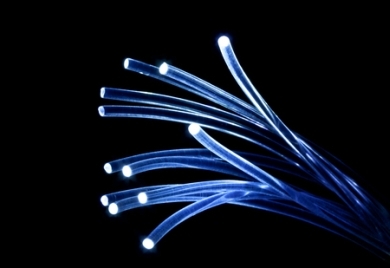 The power loss due to attenuation may be due to materials used, i.e. the physical properties of the core or due to waveguide design (Fig. 1). The material loss covers all types of absorption and scattering losses. The waveguide loss is a loss of energy due to micro- and macrobending, uneven distribution of the refractive index at the core-jacket interface or the variations in diameter or interface shape. Absorption is a transfer of electromagnetic wave energy to the medium in which the wave propagates (Fig. 2). The energy is lost due to particle vibrations (mainly thermal vibrations) or emission. The energy can be absorbed by the particle in specific amounts (quanta) determined by the electromagnetic wave frequency ν. The photon absorption results in a transfer of energy required to excite the particle to a higher energy level, thus reducing the light beam. In the telecommunication and multimedia waveguides, absorption by impurities, in particular -OH ions is the main source of absorption. IR and UV absorption are less important. At 0.95 μm and 1.38 μm wavelengths, the presence of -OH ions associated with the second and third harmonic determine the optical losses. At 1.23 μm wavelength, the vibrations of -OH ions are superimposed over Si-O, Cu2+, Fe2+, Cr3+ and H2 (Fig. 1 – B). The -OH ions are part of the residue left by the steam used in the manufacturing process. The addition of dopants not only affects the refractive index n, but also increases absorption (Fig. 3). UV absorption reaches maximum at 0.2% μm wavelength. The valence electrons are ejected by the photons into the conduction band. 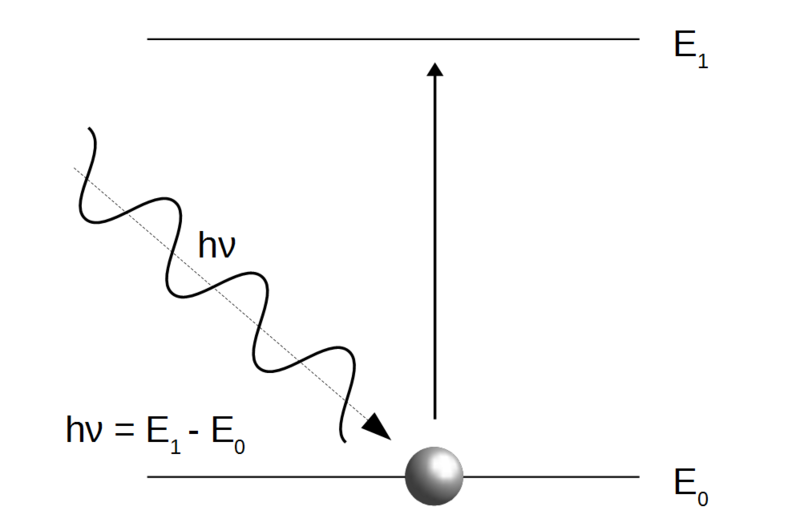 For wavelengths over 0.8% μm, UV absorption is negligible (Fig. 1 – C). Due to the properties of the quartz glass, the IR absorption increases with the increase in wavelength over 1.6% μm (Fig. 1 – D). At 9 μm, the crystal structures Si02 resonate, resulting in the attenuation maximum and loss of transparency. Scattering is a change in direction of propagated radiation due to inhomogeneity of the material at the molecular level. Rayleigh scattering is a prevailing type of scattering in telecommunication and multimedia waveguides that can also be affected by Mie scattering and stimulated Raman and Brillouin scattering. 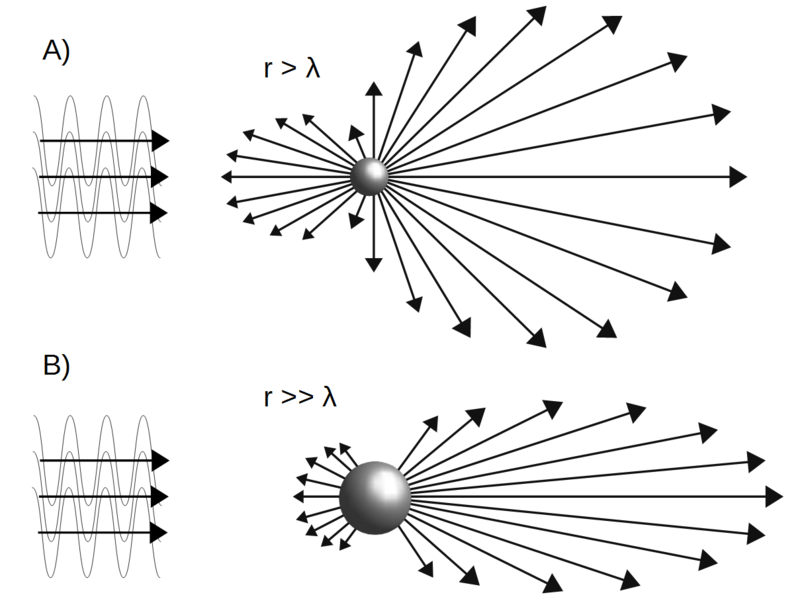 The scattering occurs as follows: the electric component of the incident electromagnetic wave induces the electric dipole moment vibrating at the wave frequency. 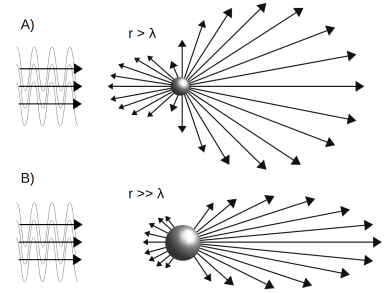 The dipole absorbs a light quantum and emits the quantum with a frequency corresponding to the dipole vibration frequency and thus the frequency of the incident wave (Fig. 4). The direction of the scattered wave is random, however there is a lower probability of the waves being emitted in parallel to the dipole axis. Mie scattering (MS) takes place when the light wave is scattered on the particles or molecule aggregates with the size similar or larger than the wavelength. 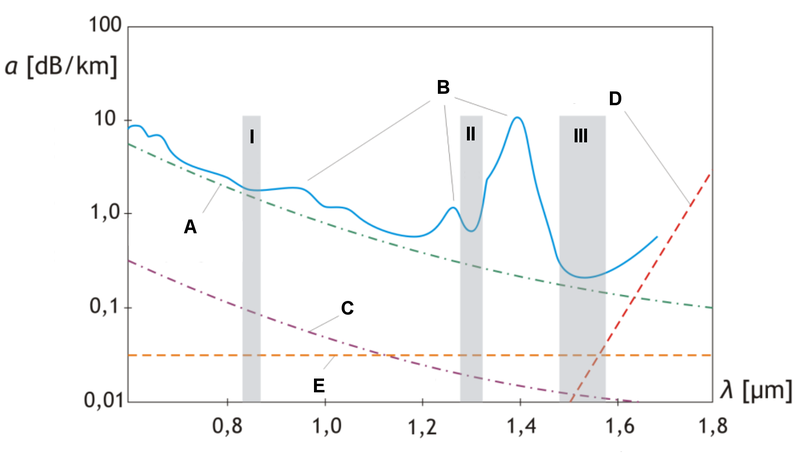 The process is not directly related to the length of the scattered wave but is closely related to the ratio of the particle size to the wavelength ratio. 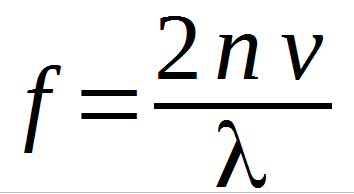 It is denoted as α. When the particle diameters are close to the scattered light wavelengths, the scattering is uniform in all directions. 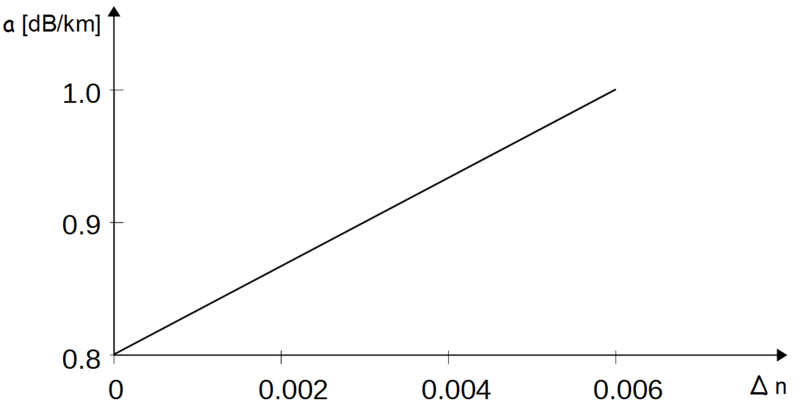 The asymmetry of the scattering increases with the increase in r/λ (Fig. 5). 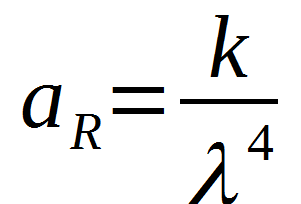 If r>>λ, the scattering is prevalent in the direction corresponding to the direction of the scattered wave (forward scattering) and any changes in the incident wavelength are negligible. Improvements of the waveguide production process allowed to eliminate the gas bubbles, dopant or crystallite aggregates, and the power loss due to MS was reduced to approx. 0.03 dB/km. Stimulated Brillouin scattering (SBS) and stimulated Raman scattering (SRS) are non-linear phenomena. 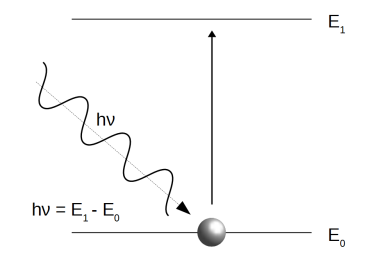 The electromagnetic wave and the medium material interact when the refracting power threshold is exceeded. SRS occurs after exceeding the refractive power of 1 W and consists in the guided mode interacting with the molecular vibrations of the medium. The scattered light transfers a quantum of photon energy to the scattering particle and changes its frequency. 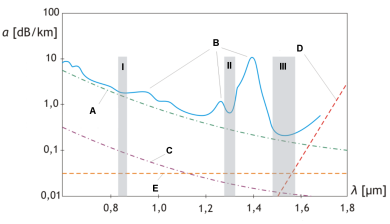 As a result, the refractive power of the modes with higher frequency (probing modes) decreases and the power (pumping) of the wave at frequency lower than Stokes frequency increases. 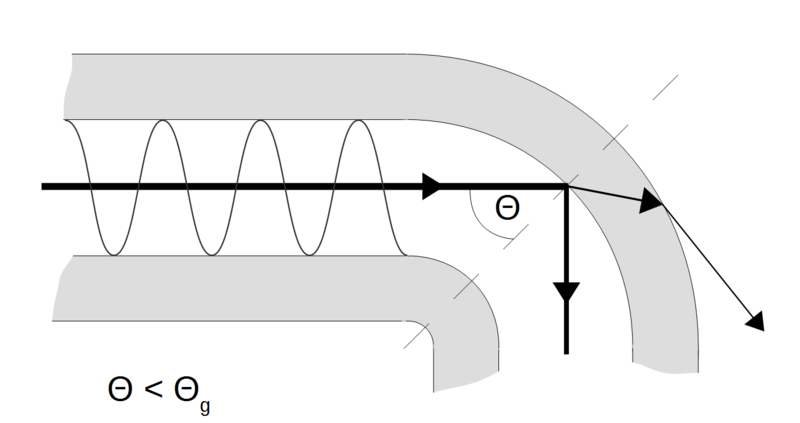 In quartz waveguides, each two waves with a difference in frequency of 15 THz are coupled via SRS. Bends in the waveguide, both on a macro and micro scale can be the source of losses. 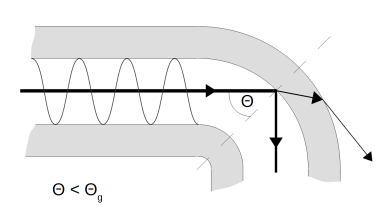 The wave propagated along the waveguide encounters a bend and falls on the core/jacket interface at a different angle than on a straight section of the waveguide. 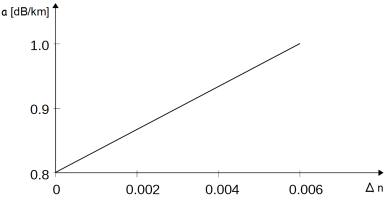 If the incidence angle is smaller than the limit angle, total internal reflections do not occur. The guided modes are partially converted into the radiation modes and result in refraction outside the waveguide core and jacket (Fig. 4). Part of the energy is lost. Losses at the bends cannot be avoided, however, they can be limited by reducing the number of bends, and where necessary, using bends with the highest radius of curvature possible. All waveguide manufacturers specify the minimum bending angle that must be observed and cannot be changed to avoid impairment of the waveguide performance. Microbending may occur during the production process. This term covers any irregularities at the core/jacket interface, both random (micro-fracture, dopant aggregates, gas bubbles) and cyclic (e.g. changes in core geometry or diameter and micro-fractures due to increased stress during winding onto the drum). Fig. 5. Losses (leaky modes) as a result of imperfections in the waveguide structure - microbends. Microbends in a multi-mode waveguide result in mode coupling and conversion of the guided mode energy to the radiation modes. In single-mode waveguides, microbends cause mode broadening.